I love clipboards, not sure why, maybe I wore a tight light khaki skirt suit in my past life and chewed on a pencil whilst clutching my clipboard to my bosom and tut tutting! 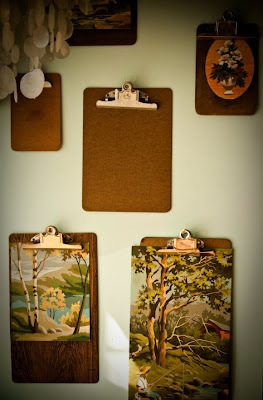 I have been collecting vintage clipboards as well as some new ones to customise for FROZEN CHARLOTTE. Debuted the first few at the IHEART market this last Saturday. They are wicked clever to display a mix of prints, make an awesome inspiration board and come in all shapes and sizes. Because I am a headless chicken I did not take any photos on the day but I know some lovelies that did, will post once I have borrowed some pics. For the time being check out my PINTEREST board VINTAGE CLIPBOARDS.